SQUIER STRATOCASTER TURNED INTO A BUILT-TO-ORDER SUPERSTRAT! 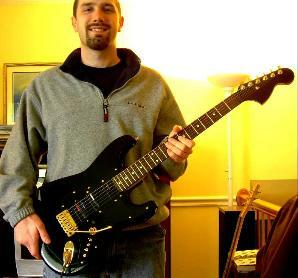 This owner wanted a stratocaster that was made 100% to his specifications - a superstrat. After multiple discussions, he decided to start with his black Fender Squier strat, which had a good neck and body, and replace the rest. The color scheme was to be nothing but black and gold - no pickguard laminations even. The single humbucker pickup would be replaced with four lace sensors, the hardtail bridge was to be replaced with a Gotoh fulcrum tremolo, and staploks installed. The Squier headstock would be painted black. Wiring was left up to me. After the headstock was painted, the body was routed and shielded. Now it was time to assemble all the parts into a superstrat. The images show cavities painted with shielding conductive paint. Step one - paint and polish the headstock, and install new gold tuners. Step 2: route the body to allow for three pickups and new wiring. Step 3: route out the body from both sides for the tremolo. And here is the happy owner with the finished product. The back cover has a removable access panel - the switching includes three 3-position pickups switches (bridge:humbucker/off/single coil, middle: in-phase/ off/ out of phase, neck:in-phase/ off/ out of phase), a tone switch equivalent to tone control at about 6, at 10, and at 0, and a single volume control. The unusual tone switch turns out to have two very usable settings. Color-wise, the only parts that aren't either gold or black are the logos on the pickups, and the neck.